For those of you who do not have the time to bake your own soda bread every day Irish Pride bake a delicious Buttermilk Soda for you. Baked daily with fresh ingredients including buttermilk and the finest wholemeal flour our Buttermilk Soda is baked in a style following the long tradition of soda bread in Ireland. 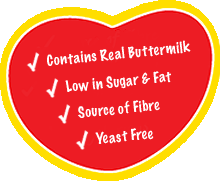 High in fibre and low in fat, Irish Pride Buttermilk Soda tastes delicious and is the perfect accompaniment to a hearty breakfast or as an evening snack. This bread contains wheat, gluten, and buttermilk. This bread may contain traces of sesame seed.